Thursday morning, in my middle-school classroom, a student shouted gleefully, "My spell just put the whole town to sleep!" At another table, a boy examined his character sheet and asked, "If I get Signature Gear for my backpack, does that mean all my stuff is invulnerable?" Nearby, a girl confided, "Instead of being a Cat-Folk, I've decided that I'm a human who can turn into a leopard!" This is not some experiment in gamifying social studies. It's part of a weekly program at my school where teachers sponsor a variety of activities intended to appeal to student interests beyond core academics. This spring, a colleague and I have had the privilege of introducing 20 middle schoolers to the Dungeon Fantasy Roleplaying Game. But they were doing it all wrong. In preparation for the activity, we purchased a few box sets, GM screens, and extra dice at a local game shop. We capped the activity at 20 students, divided into four tables of five — one GM and four players. 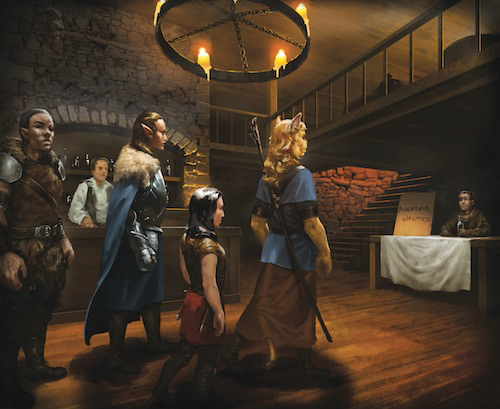 We selected a set of pregenerated characters from the Delvers to Go book in the Dungeon Fantasy GM Screen and various characters posted to the DFRPG forum. For simplicity's sake, we limited roles to warriors (mostly knights and barbarians), clerics, wizards, and thieves, recommending that groups select one character from each role. We modified a few characters to keep things appropriate for middle school (e.g., no lechery) and ensured that there was a diverse array to choose from. At our first 45-minute session, I gave a short presentation on the basics of roleplaying games and the 3d6 mechanic in DFRPG. Students formed groups and chose a GM. As students chose characters, we looked over character sheets together, made adjustments, and discussed the significance of key abilities. Disadvantages and quirks were popular topics, with most students immediately appreciating the value of a clever quirk. I planned to run an interactive tutorial on combat at our second session, but the students were raring to go. No more tutorials . . . they wanted to game. Two of the four GMs already had their own adventure ideas; the other two used I Smell a Rat. My teaching colleague and I simply made ourselves available to answer questions as they came up. Rules fidelity was loose. Very loose. Remembering my own early days of gaming (where we misunderstood half the rules and made up the other half) helped me to swallow my affront at the beautiful system being shredded around me. Rarely have I seen 20 students more excited about an endeavor at school. So I shrugged, grinning at the proposition of a Backpack of Invulnerability, giving a thumbs-up to the Were-leopard of Doom, and replying to the intrepid archmage, "The whole town?!? Amazing!" They were doing it exactly right.